David T. Blaetz is an instructor in Gannon University’s School of Communications and the Arts by day, but on weekends, he can be found performing music. Over his musical career, Blaetz has been a part of 37 bands, ranging from pop music in junior high and jazz in college, which led to jazz rock, classic rock, folk rock and blues bands. “I have always enjoyed accompanying singers who cover a variety of styles,” said Blaetz. 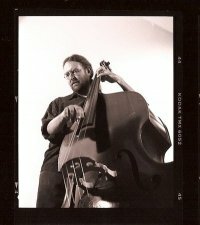 He is currently a bassist and accompanies Sam Hyman as well as The V Band, along with playing in his own band, the Heliotrio, and picking up an occasional jazz gig. His passion for the music industry began at a young age, in elementary school, where he played viola, cello and acoustic bass in his school’s orchestra. “Suddenly I was spending much more time playing that acoustic bass along with my Beatle 45s than rehearsing the ‘Blue Danube Waltz,’” Blaetz said. Since then, Blaetz has been a devout bassist. “I have been a bass player my entire life,” Blaetz said. Some of his favorite musicians who shaped him in his formative years as a musician include bassists Ron Carter, Charlie Haden and Dave Holland. However, Blaetz notes that his favorite musicians are often the ones he performs with on a regular basis. He credits in particular, musician Charles Ventrello as being a mentor to him. At Gannon, Blaetz says he mostly teaches courses on video and audio production, but speaks highly of the audio production class in particular. Blaetz also mentioned that there is an advanced production course in the early conception stage right now. Prior to his time at Gannon, Blaetz worked in advertising as a producer, director and videographer. Before that, he was a public access studio manager and workshop video trainer, and while in school, he worked in a record store. When he is not teaching or performing, Blaetz can be found playing golf and bicycling, although what’s most impressive might be his commitment to binge-watching and streaming movies. As a self-proclaimed “movie nut,” Blaetz says he enjoys watching movies from the comfort of his very own home theater room. Touching on all aspects of his life, electronic media and music specifically is the passion of instructor David T. Blaetz, a man who continues his love for music and production through his teachings at Gannon.